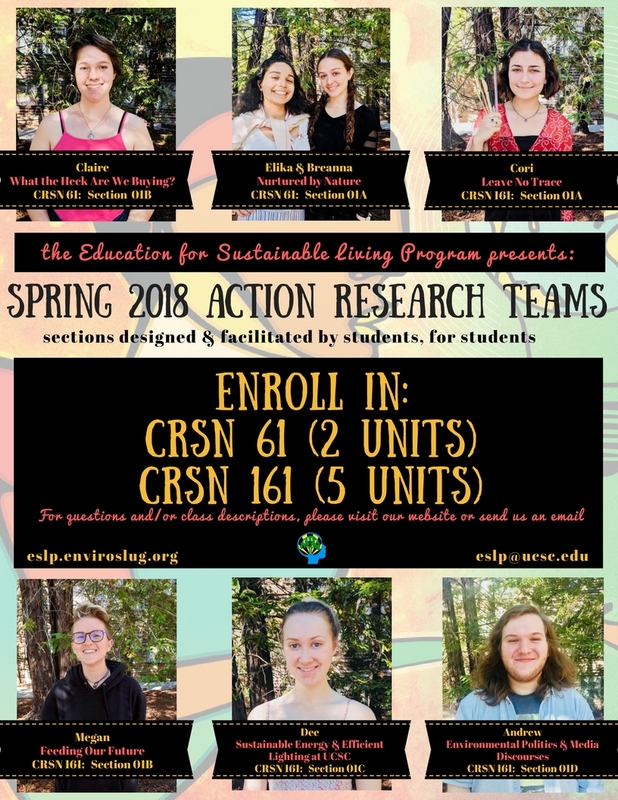 This Spring quarter, undergraduate students at UCSC will facilitate their own Action Research Team on a sustainability topic they are passionate about in conjunction with our Speaker Series. Enroll in one of the following Action Research Teams in your MyUCSC portal today! For a list of topics these ARTs are based on, refer to the Blueprint for a Sustainable Campus. To facilitate your own ART, you first must apply during Fall quarter. All facilitators are required to enroll in the 5-unit Winter Training Seminar (CRSN 160), where they will learn facilitation skills, project management techniques and develop a Group Project Plan. The Action Research Teams can be co-facilitated by two students, are either 2 or 5 units, and often comprised of small groups of 10-15 students enrolled in each. Enrolled students will engage in discussion, research and projects related to your topic throughout the quarter. 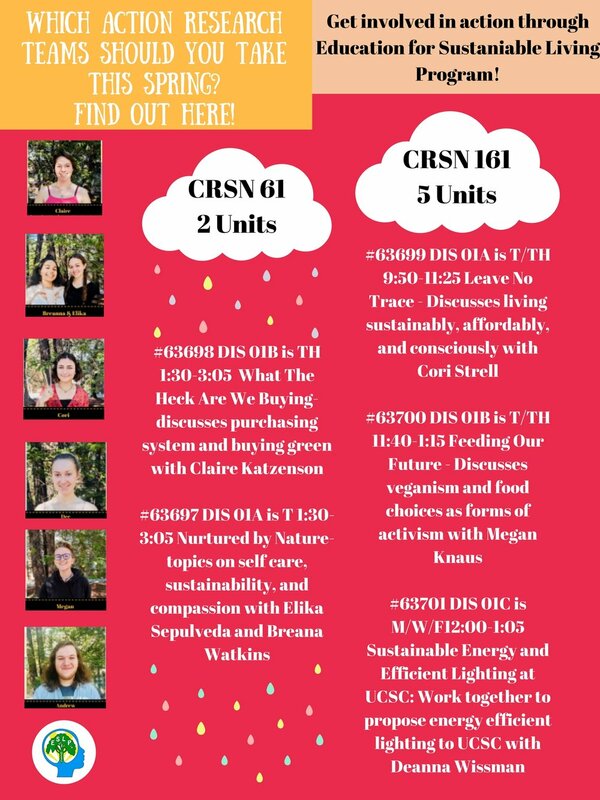 Both students and facilitators in the ART must attend the Monday Night Speaker Series for the possibility to receive full credit in either CRSN 61 or CRSN 161. Facilitators will receive an additional 5-units of credit for facilitating their Action Research Team and attending the Speaker Series in Spring, via Independent Study. At the end of the Spring Class, each ART showcases the work they accomplished and celebrates goals they achieved. Check out our Facilitator FAQ page or or check out an example of a past application from co-facilitators.